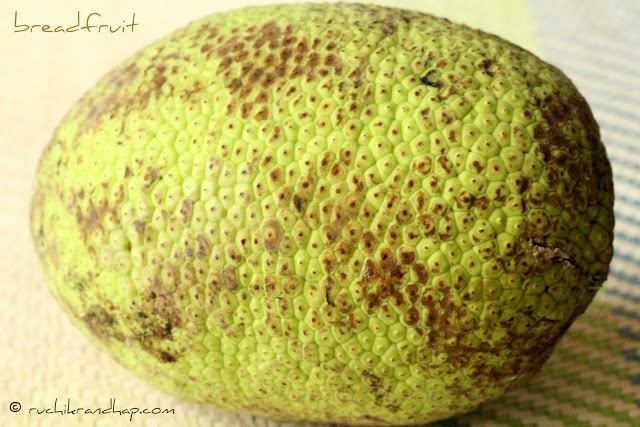 The Breadfruit is almost an alien vegetable to those who live in the northern hemisphere of our country. It looks like a close cousin of the Jackfruit & belongs to the Mulberry family. It is found in tropical climate and a very famous and much loved vegetable at that in Mangalore. I am not sure if it is commercially grown today but as far as I know most of the Breadfruits found in Mangalore are usually sourced from people who still have the tree growing in their backyards and owing to this even the smallest of Breadfruits sell like hot cakes at exorbitant prices. Most times this fruit is destroyed by birds even before it can be plucked and does not have a long shelf life which makes it all the more dear. The breadfruit, cousin of the more popular jackfruit is cooked when it is still green on the outside and slightly yielding to the touch. An over ripe breadfruit turns mushy and the one that has been plucked too early isn’t suitable either. 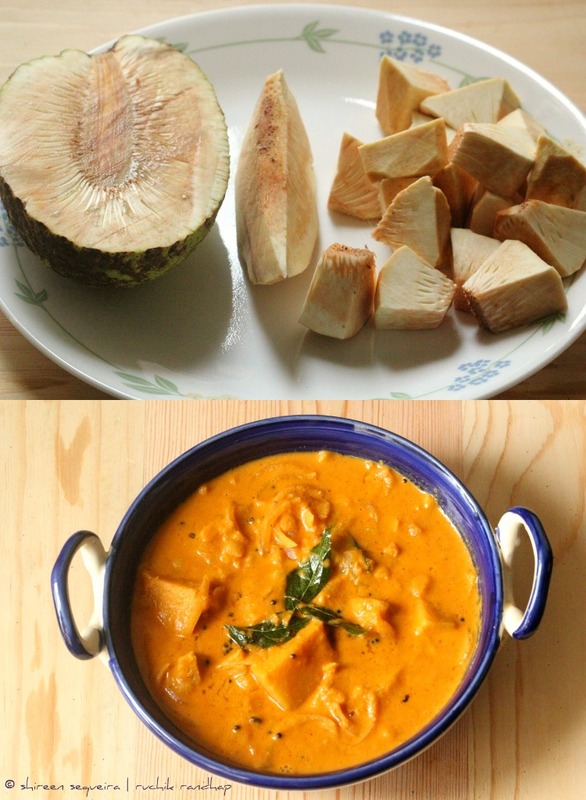 The breadfruit is counted amongst vegetables rather than fruits. The term ‘bread’ is probably given to it as it has this mealy potato like taste to it and is dense in texture that can be sliced like a bread and if baked can taste like freshly baked bread. Breadfruit or Deeviso Guzo/ Jeev Kadgi as it’s called in Konkani (Jeegujje in Kannada, Nirphanas in Marathi and Bakri Chajhar in Hindi) is not only relished in South India but is also much loved across South East Asia & the Pacific Ocean islands and its botanical name is Artocarpus Altilis (phew! – we are better off calling it the Breadfruit, aren’t we?). It tastes best when fried – the breadfruit cut into vertical slices & coated in a simple Meet Mirsang (Salt & Chilli) marination. The fruit is also cut into cubes/chunks and cooked in a stir fry style with grated coconut, spice powders and tomato to flavour a dry dish which is eaten as a side dish/accompaniment to the main dish of the day. When I was a child we were often given free Deeviso Guzo by our generous Brahmin neighbours – the Bhats who had 2-3 trees in their yard yielding many fat & round Breadfruits enough to fulfill their family’s needs and those of their neighbours. The master of the house would call out instructions every morning to his house help to go & pluck the best Breadfruits – they would then pluck them using a ‘Thenkdi’/ Dhonti (A thin long Bamboo stick with a sickle tied at one end) which was an indispensable houshold tool with a variety of uses especially to pluck fruits in the garden. There was a lot of fun that was derived from this simple act, the more the merrier. Anyway, gone are those days. Even today when I go to visit my mum, the kind old gentleman comes to say hello carrying a basket with at least 3-4 large Breadfruits which I carry back with me to Mumbai as if they were gifts of gold (although we do get tiny ones here occasionally which cost a bomb). The taste of fried slices of the Breadfruit is par excellence and is on the list of favourites of every Mangalorean I am sure. The vegetarians relish it as much as the fish eaters relish fried fish and the fish eaters of course relish it just as much. 5. 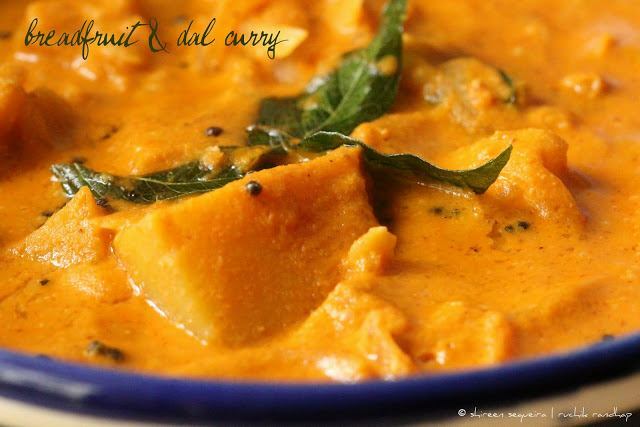 Season the curry with the seasoning for which you need to heat some oil in a pan and toss in the mustard – when they splutter, add the curry leaves and add this mixture to the curry. Just love your blog for all that info..The trouble you take to write them with a toddler around. Amazing Shir! Never knew so much bout bread fruits. Thanks Sharmilee, Rinku & Santosh! @ Rinku: Even I learn as I write my posts baby 🙂 thanks for all ur encouragement & support – love u! such a yum recipe shireen – love it ! Simply superb, very new dish for me, sounds delicious. Just awesome, the way you put pics and make me feel the usual thing which mom prepares special! Have seen a lot of blogs to post pics about Mangalore food. This blog is indeed the best. 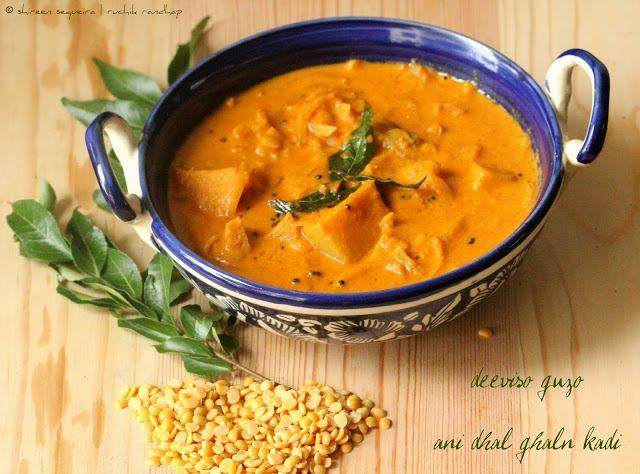 Thank you for this recipe as Ive been looking for a vegetable curry with dal in it as my mom used to make Cauliflower curry the same way. Keep posting new recipes..
Hi, you mean cauliflower with dhal or just the veggie? Thanks madam. We tasted bajjias made out of this vegetables for the first time. Your descriptions made it tastier now. @ Babita: Thanks so much for your comment!